Who doesn't love glitter glue? Your child wants to add a splash of sparkle to her art. What’s a mom to do? Help her to mix up a batch of her own colorful glitter glue! I’m somewhat of a tissue paper addict. I use it for everything from wrapping gifts to making collages and creating water color paints. If you buy the non-colorfast kind, you’ll quickly see that the bright and bold hues easily rub off. While this may seem like a con when it comes to your child’s now-messy hands, it’s a pro when you’re trying to create colorful DIY products. Ask your child to choose her favorite tissue paper color, a matching shade of glitter and get ready to punch up a basic art staple: Glue. 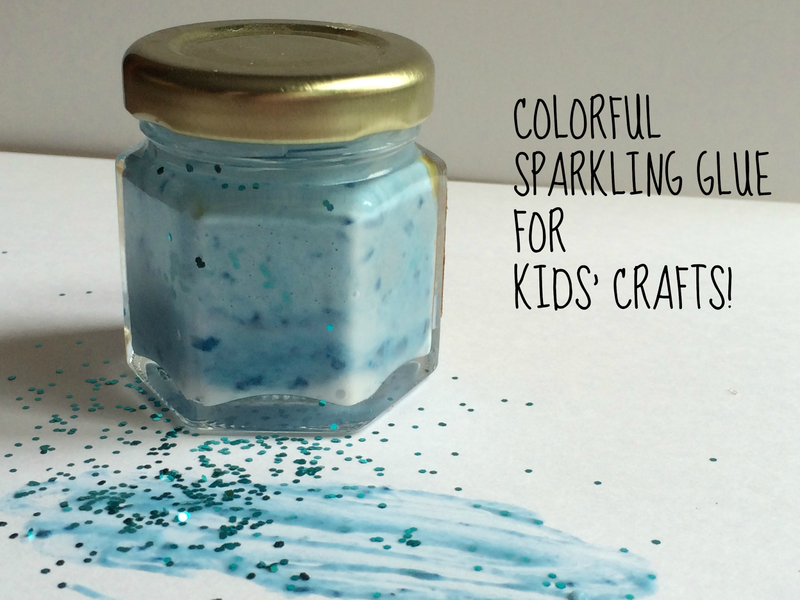 Bottle up your child’s ooey, gooey, sparkly creation and use it for any artsy activity that requires glue. It will leave behind a subtle hint of color and a glittery sheen. As a bonus, it’s super-simple to make. · Tissue paper- You need to use bleeding or non-colorfast paper in order for this project to work. · A craft stick- Or you can reuse a popsicle stick. 1. Fill a baby food-sized jar half way full with glue. 2. Tear off a piece of tissue paper. Bright hues work best to transfer the color. Your child doesn’t need a large piece. Size the tissue to approximately the same the size of the jar’s lid. 3. Push the tissue into the glue. 4. Stir the tissue paper and glue with the craft stick. Your child will need to spend at least a few minutes stirring it through. As she stirs the color will begin to transfer to the glue, turning it a new shade. The tissue will slowly dissolve. The more that she stirs, the less lumpy the glue will be (like beating out the lumps in cake batter). 5. Sprinkle glitter into the glue. 6. Mix the sparkles into the colorful glue. 7. Place the lid on the jar and tighten it. Use the glue now or save it for later. Are you looking for more super-sparkly glitter crafts? Check out and follow my Pinterest board for ideas! Thanks so much Jeanine! When I first started teaching young children's art classes cleaning up the tissue mess (when the colors would bleed all over everything after one of the kids dropped water on it) drove me nuts. Then I realized that it makes a great way to tint or print -- and it's something that kids don't usually expect! Thanks! It's funny how when the color transfers, it can be a good thing. What a fun idea. Very creative. What a great idea. I wonder what it would look like with bits of colored tissue left in? Thanks for sharing on Merry Monday. Pinned. I actually did that first. It dries with a really neat looking texture! This is a great idea, we go through a TON of glitter glue. Thanks for sharing! Hello from T.G.I.F. Linky Party!